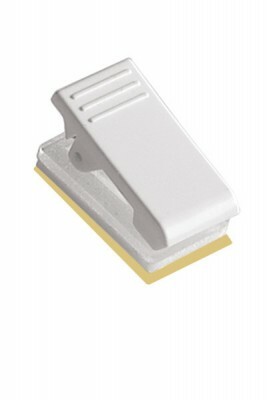 This white plastic, pressure-sensitive, ribbed thumb-grip clip is a great accessory for ID or access cards. The thumb-grip clip has a pressure-sensitive fitted square base that sticks onto the back of a card. The plastic pressure-sensitive clip is finished with a ribbed thumb-grip, making it easy to open.